Vizimpro (Dacomitinib) is indicated for the treatment of a certain type of lung cancer or a non-small cell lung cancer (NSCLC). It is a type of condition that has already spread to other parts of the body. NSCLC is a type of lung cancer that originates in the epithelial tissue of the lungs. The mutation of EGFR protein is responsible for the normal cell development and multiplying of cells. It is the main cause of the cancer. Mutation in the EGFR gene encoding for EGFR protein leads to abnormal development and production of the cells. It causes the formation of tumor cells. The epidermal growth factor receptors (EGFR) are proteins that receive signals to control the development and survival of cells. Mutations in EGFR can cause uninhibited growing and increase of cancerous cells. The active substance in Vizimpro is Dacomitinib. It is an inhibitor for the EGFR family of tyrosine kinases. It is an enzyme that promotes cell growth. It is by irreversibly attaching to mutant EGFR, Vizimpro (Dacomitinib) helps to slow the growth of cancerous cells. 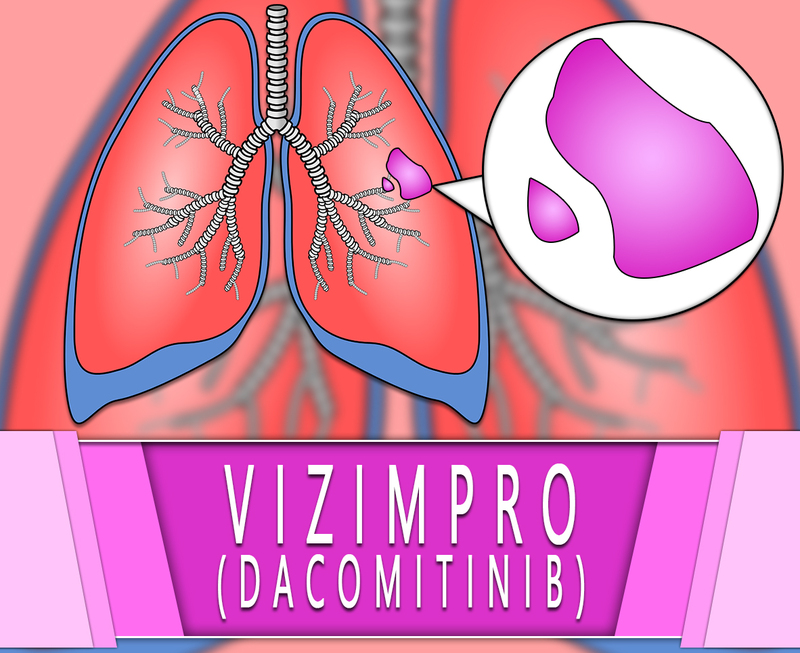 Vizimpro (Dacomitinib) is an oral kinase inhibitor. This has been approved by the Food and Drug Administration (FDA). Each tablet of Vizimpro has 45mg, 30mg, and 15mg of Dacomitinib for oral administration. Dacomitinib is a white to pale yellow powder. How to use Vizimpro (Dacomitinib)? The dosage is based on your medical condition and response to the treatment. Take this regularly to get the most benefit. To help you remember, take it at the same time each day. Vizimpro (Dacomitinib) is usually taken once a day. You may take it with or without food as directed by your doctor. Swallow the tablet as a whole do not chew or break it. What are the side-effects of Vizimpro (Dacomitinib)? Tell your doctor if you have any medical history or current medications. Inform also your doctor if you have any allergies. Consult your doctor if you are breastfeeding, pregnant, or planning to get pregnant. Limit your time in the sun. This medication may make you more sensitive to the sun. Call for medical help right away if there is an allergic reaction.